Extremadura offers the best of old Spain, home to some of the country's most beautiful medieval towns and cities, some impressive Roman ruins, great swathes of wonderfully green farm hills and some of inland Spain's finest food. The best places to stay in Extremadura come in a range of shapes and sizes, from luxurious converted palaces to restored farmhouses, but they all tend to have excellent restaurants. Extremadura is more popular with Spanish travellers than foreign ones, and many of the Spanish are here for the food too. And for the historic sights of Trujilo and Cáceres or the dramatic, open spaces and vast skies of the Parque Nacional de Monfrague. If you want to see the highlights, you'll need to get yourself lost in the labyrinthine hearts of several towns and cities, where you might come across working Roman theatres and exceptional Roman bridges, an impressive range of buildings inspired by a range of religions, a slew of interesting museums. You should also endeavour to get out into the countryside and explore a little of the region on food. Don't worry, there are plenty of charming hamlets with their impressive farmer's markets to keep you sustained along your journey. 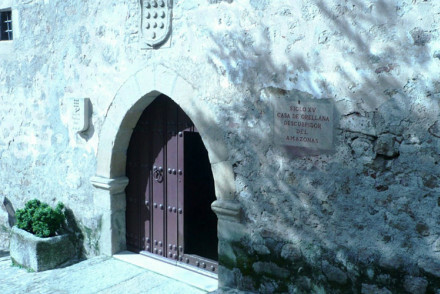 Casa de Orellana is a beautiful, five room hotel converted from a 15th Century manor house in pretty, medieval Trujillo. There's a pool and a lovely garden courtyard, and you're close to many of Trujillo's historic highlights, as well as being close to all that impressive scenery. La Casona de Valfrio is a rustic, country farmhouse on the edge of a national park, converted into a small hotel with plenty of charm. There are beautiful stone terraces overlooking luscious gardens, and you're in s great spot for exploring the local towns, monasteries. valleys and gorges. Convento de la Parra has been beautifully converted from a former convent in a wonderfully secluded spot. 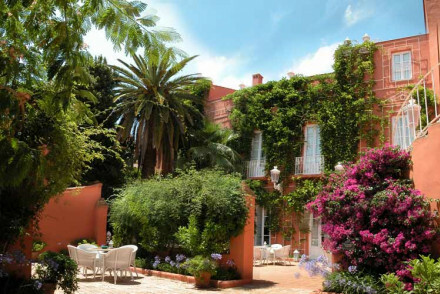 The 21 rooms are arranged around a lovely courtyard full of orange trees. There's also an outdoor pool, excellent regional cuisine and it's a wonderful spot for stargazing in the evenings. The Casa Palacio Conde de la Corte is a beautiful old palace in the centre of Zarra, with a glamourous, slightly Italian flavour to it. There are 14 bedrooms, each individually, and romantically decorated. 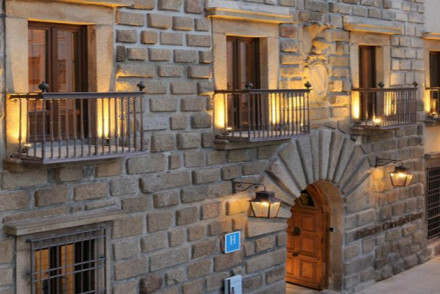 The Atrio Hotel Restaurant in Cáceres is quite hip and happening for these parts, with a fabulous two star Michelin restaurant and carefully designed designer rooms and living areas, including art by Andy Warhol, inside a traditional facade. 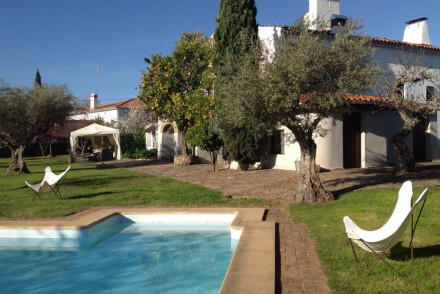 Valdepalacios is an idyllic, 29 room country house hotel set amongst bright green fields. As well as elegant living areas and romantic rooms, this hotel has an excellent catalan restaurant and a state of the art spa. Still not sure which to book? 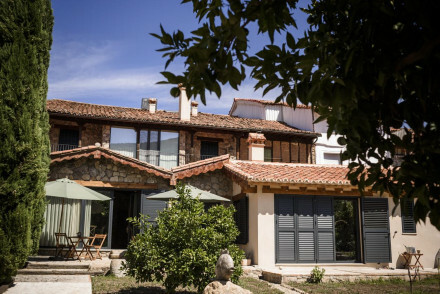 Browse through our list of all the best places to stay in Extremadura, try our recommendations in neighbouring Andalucia or contact one of our friendly Gurus for advice. A stunning hotel in the countryside. Rooms are the ultimate in laid-back chic, with white washed walls, stone floors and rustic furnishings. An orange tree courtyard, solarium, outdoor pool, and excellent regional dishes. Romantic, relaxed, and very luxurious. 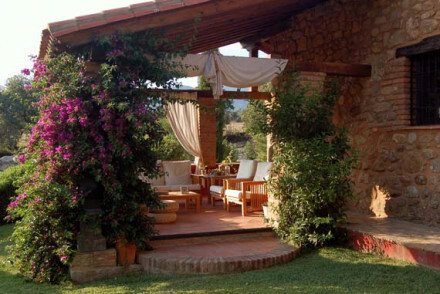 A converted olive oil mill nestled in the rugged greenery of Extremadura, furnished with traditional rustic design. The best rooms have access to balconies or terraces. The tranquil pool and bar are surrounded by olive and almond trees. A relaxing rural escape. Charming and rustic family-run hotel in the heart of Extremadura. All 12 of the en suite rooms are uniquely decorated, many with wooden beams and bright skylights. The nearby Sierras are visible from the pool. Locally sourced Castilian food is prepared daily. Perfect for couples and families alike. Lovely hotel in the centre of Olivenza. Rooms are comfortable and tasteful, some tradition, some contemporary. With all the town's major attractions a short stroll from the hotel, it's the perfect launchpad for exploring the fascinating history and culture of the frontier town. Sights nearby - Santa Maria Magdalena and Olivenza Castle are two minutes walk away. Local markets - Explore the local markets of Olivenza. 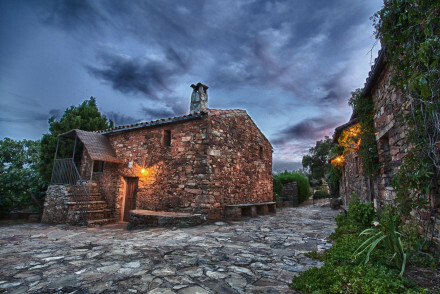 Restored hamlet in rural Spain on the border with Portugal. Five separate self-contained houses with high beamed ceilings, open fires and antique furnishings. With an outdoor swimming pool, horse riding, cooking courses and great walks on 130 hectare farm. Authentic, rustic and utterly charming. 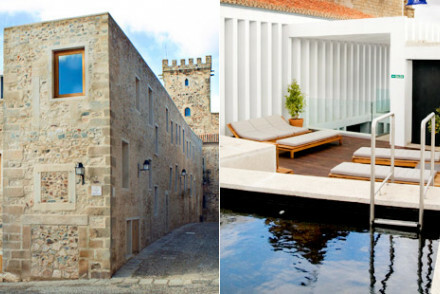 A medieval building that's been artfully renovated. Luxury throughout with impressively large rooms featuring exposed stone walls and gorgeous bathrooms. The restaurant, serving gourmet cuisine, sits in a medieval style hall. Walking distance from the historical centre. Highly recommended. Local exploring - Situated just a short walk from the historic town. Sights nearby - Marvel at the 'Centro de Interpretación de la Ciudad Medieval' the best-preserved defensive tower of the old city wall. A beautiful old palace in the centre. Heaps of glamorous tradition throughout - antiques, paintings, ivy clad balconies, stuccos. 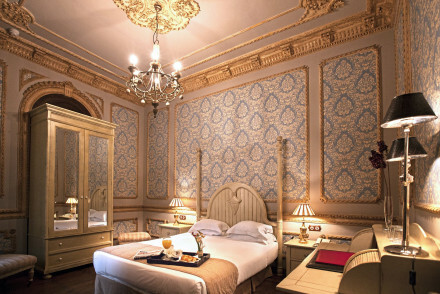 Romantic bedrooms and suites are individually decorated, some with four poster beds. Excellent restaurant, lovely garden, and a big swimming pool. A beautiful little hotel, previously a 15th century manor house steeped in history. Just five charming bedrooms, lovely sitting room, pretty walled garden, and fantastic swimming pool for cooling off. An intimate spot to completely relax in. Many interesting historical sights in this medieval city. Sights nearby - A short walk from the hotel stands the castle, the fabulous Plaza Mayor and the church of San Francisco. Traditional - A magnificently restored 15th century mansion. A tranquil village B&B set in a pretty garden with quaint mossy walls, surrounded by woodlands. Pretty interiors feature a homely open fire, wooden beams and exposed brick, giving it a rustic, cosy feel. Most of the rooms have terraces with lovely views of the countryside. A peaceful rural base. A rustic countryside farmhouse on the edge of a national park. Romantic floral bedrooms and one suite, sprawling stone terraces with views over luscious gardens, a simple local restaurant serving good food. Ideal for exploring local monasteries, valleys, gorges, and towns around. Sights nearby - Lots of monasteries and historic towns in the area. A fabulous Michelin star restaurant with designer rooms and living areas. A traditional facade houses sleek modern lines, works of art by Warhol, and white crisp bedding. A gourmet spot with equally astounding interiors. Designer - trio boasts sublime architecture by Emilio Tuñón Álvarez and Luis Moreno Mansilla, masters of modern design. Foodies - 2 Michelin star restaurant.